I love to make all natural homemade meals for my family! Cooking at home brings me joy and pleasure because I know exactly what goes into my meal. But good meal should not take hours to cook. Recipes loaded with numerous ingredients and long instructions for cooking just take all of the excitement away. That is why I like to make simple, quick and all natural meals for my family. Honey glazed roast duck is my family's favorite. 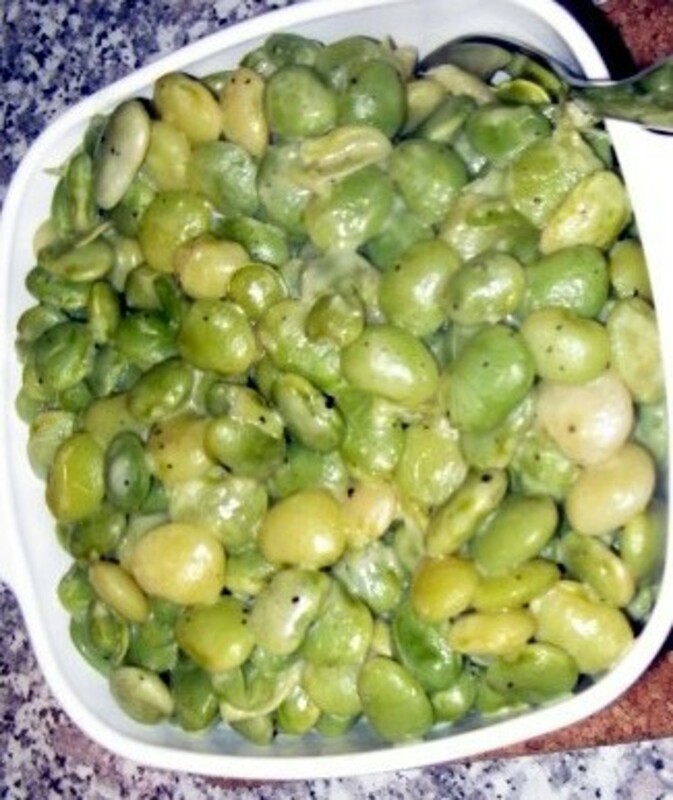 I make it at least once a week and I consider it the easiest dish to make. Basically, you will invest only about 15 minutes into preparation and after that your family will enjoy this delicious treat. This duck is super easy to make, it is crispy on the outside, soft and juicy inside. 1. One whole duck, about 5-6 pounds. I prefer the biggest I can find in my local grocery store because duck has lots of bones and I prefer to have more meat on my plate. 2. About 1/2 cup of honey. Any honey will do. I have not noticed significant difference using different types of honey. I tried clover, orange blossom and wild flowers. They all do great. 3. About 1 and a half teaspoons of garlic salt with parsley. 4. Two pyrex rectangular glass baking dishes - one bigger and one smaller. Cook time is about 2 hours. Makes about 4-6 servings. Most of the duck is sold frozen in the grocery stores. You will need to completely defreeze the duck before cooking. I also suggest taking it out of refrigerator about 30 minutes prior to cooking to bring it to the room temperature. Start preheating your oven to 375 °F. Fill a small rectangular glass pyrex dish with warm water about half way through and place it on the lower rack. Your duck will go on the medium rack to insure even roasting. Take your duck out of the manufacturer's package. Wash well, remove and discard all guts, cut the excess fat from the neck cavity. Check to make sure you don't have any feathers on your duck, pull them out if you notice any. Wash your duck well inside and outside, pet dry with the paper towel and place it on the bigger pyrex dish breast side down. Use about half of your garlic salt to season the back side of the duck. The salt amount is entirely up to you, you may add extra to the recipe if you would like. 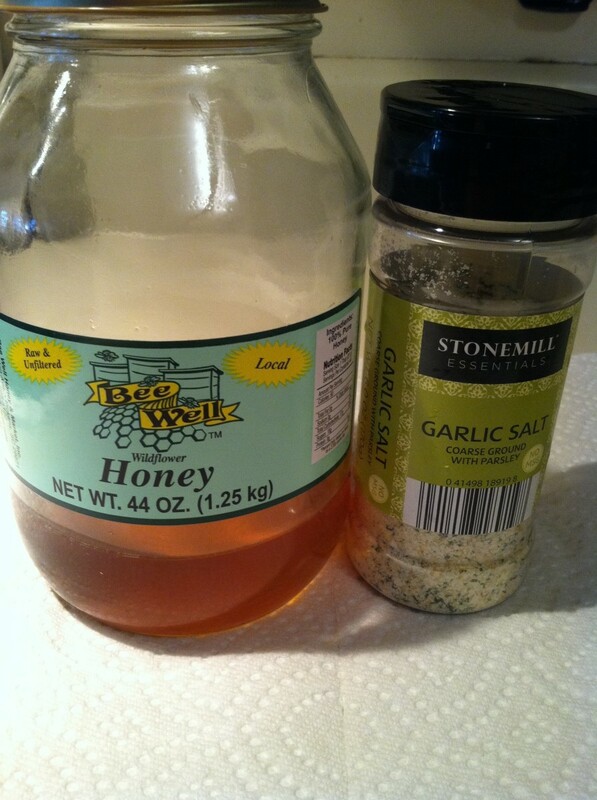 When done seasoning the duck with the garlic salt, use about half of your honey and spread it evenly with the teaspoon all over duck. 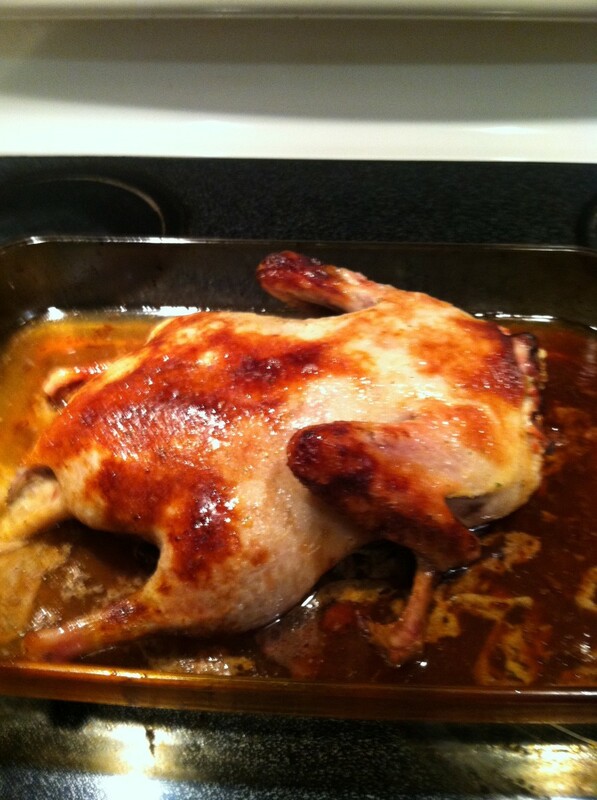 I let my honey slowly drip on the duck from the teaspoon and then rub it all over duck gently. Using the remaining half of your ingredients, repeat the same for the breast side. You may substitute honey with your favorite sauce. 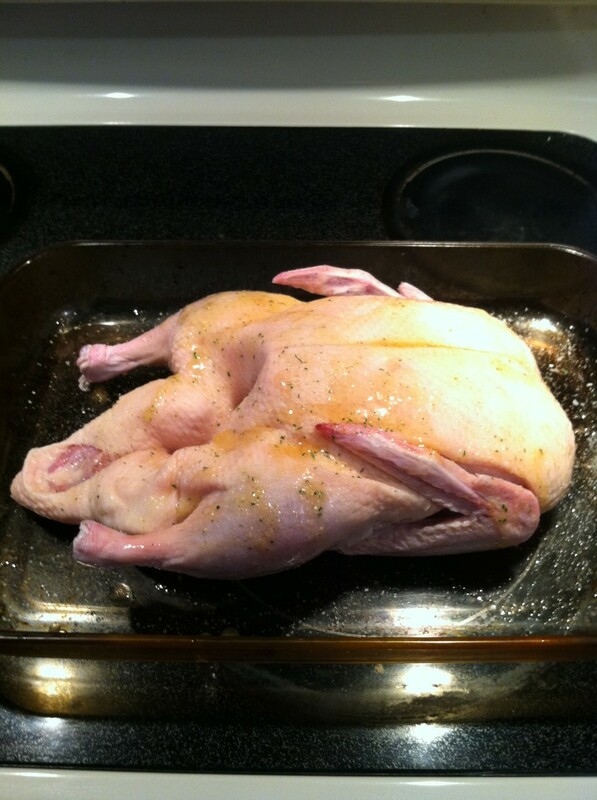 After your duck is seasoned, leave it breast side up and out it goes in the oven! In case you have a question about why I place the pyrex with water under the rack with the duck, I would like to explain. During roasting the duck will release lots of juice and fat and I find it not necessary to add any water or sauce to the duck prior to roasting. 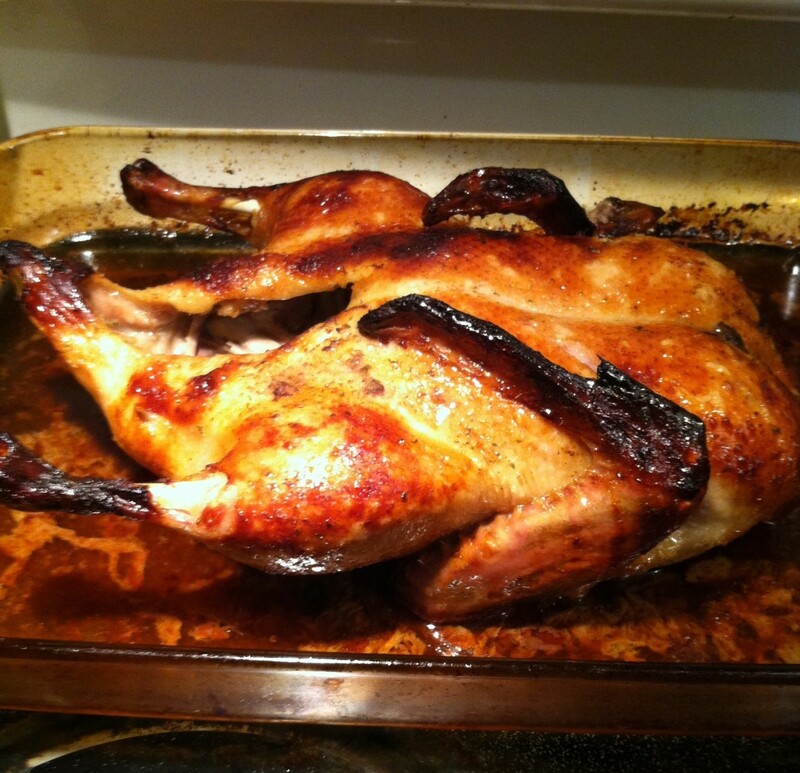 In my opinion, adding water to the duck will make it cook in the oven, not roast. For that reason, I place the tray with the water under the duck. When water evaporates, it brings moisture to the meat and makes it juicier. At the same time, it crisps on the outside. Allow the duck to roast for about 40 minutes. 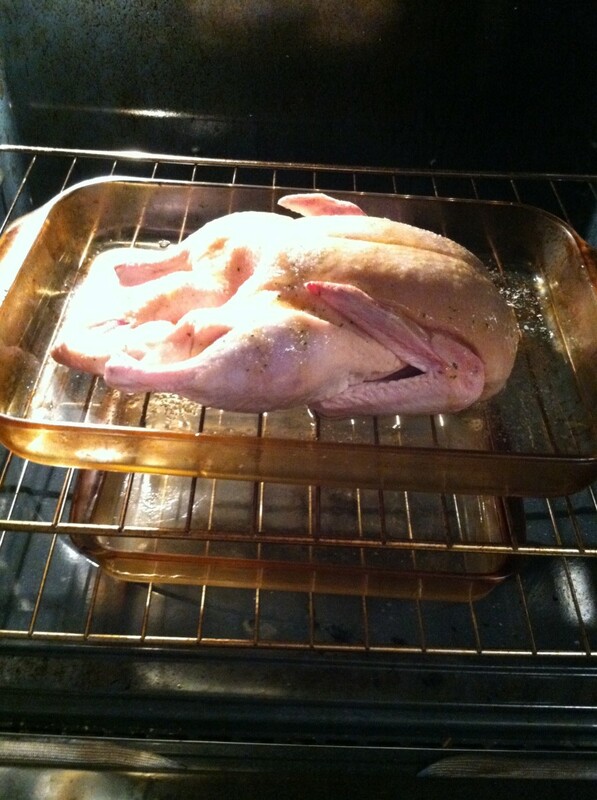 Carefully remove it from the oven and turn the duck over to the other side. Place back in the oven and allow to roast for about 40 minutes again before turning it over to the other side again. Make sure to roast the duck evenly on each side. Please note, you may roast your duck for about 10-20 minutes longer if you like to have your duck more brown and crisp. The roasting time will also depend on how big your duck is. Extra pound of duck may require up to extra 20 minutes of roasting time. 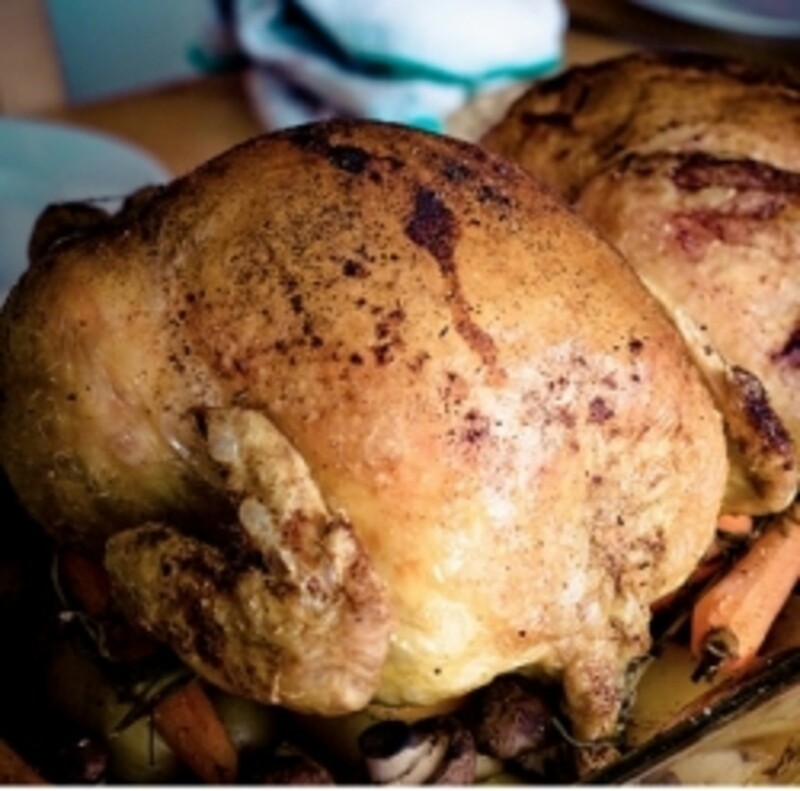 After your duck is finished roasting, remove it carefully and place it on the top of the stove to rest for about 10 minutes before carving. After this, transfer your duck to a cutting board for serving. I suggest serving your delicious roast duck with white rice and hoisin sauce on the side. 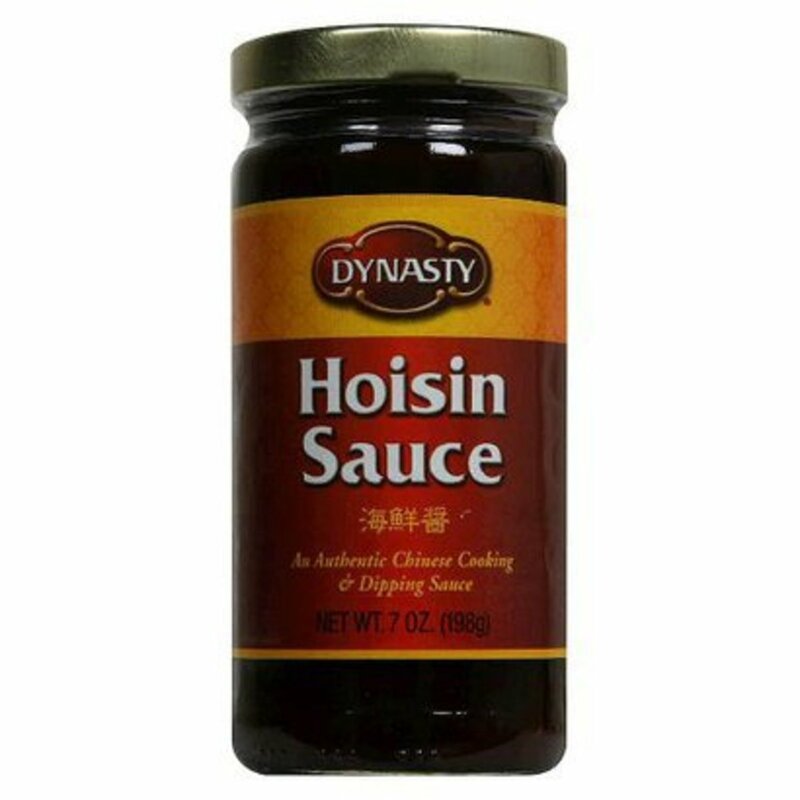 I warm up about a quarter cup of the hoisin sauce in a small saucepan on medium low and let the sauce bubble on low heat for about 2 minutes. 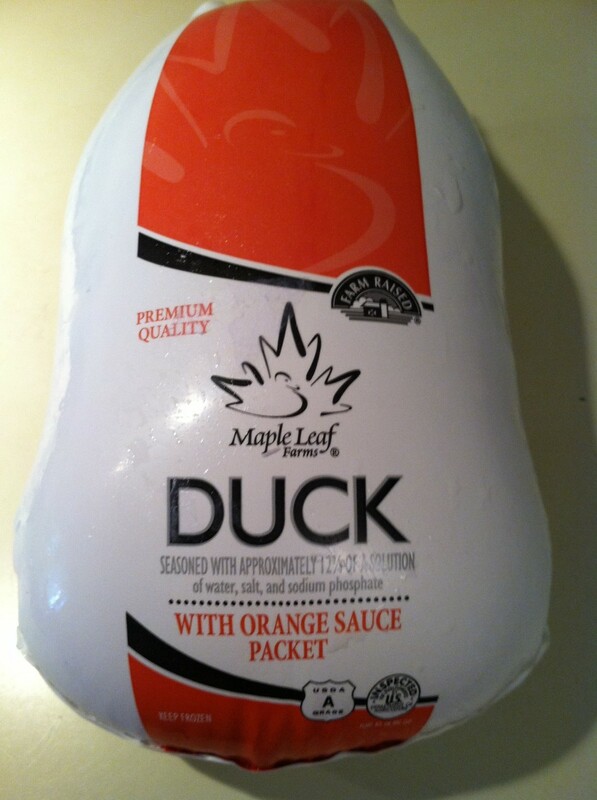 Makes a great warm sauce for your duck! Mix cornstarch and water together and set aside. In a small size saucepan add orange juice, orange peel, salt, orange preserve and heat to boil. Let the mixture boil for about 2 minutes to incorporate all of the ingredients together. Add cornstarch and water to the boiling sauce, boil on low for about 2 more minutes or until the sauce thickens. You may also enjoy simple Roasted Duck Tacos. Just use your freshly roasted duck to make some homemade tacos. Also, use some duck meat over your favorite salad. In some countries, duck soup is considered a delicacy. Below is a video on how to made a simple and delicious duck soup.